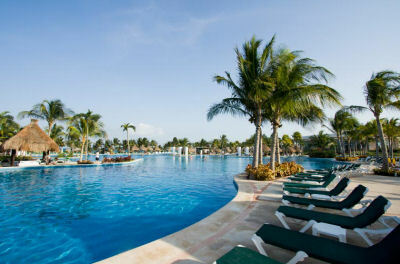 Enjoy 7 Nights at The Grand Mayan Riviera Maya Resort in Riviera Maya, Mexico! Stroll the fine white sands of Riviera Maya, near Cancun, and enjoy an exclusive, luxurious vacation at The Grand Mayan Riviera Maya luxury resort. 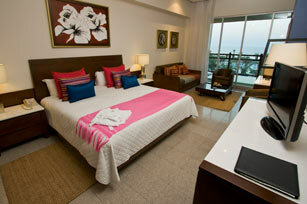 Riviera Maya is an intriguing mixture of an ancient history and natural tropical beauty. Take an opportunity to visit majestic Mayan ruins such as Chichen Itza, now one of the Seven Wonders of the World. During your stay at The Grand Mayan Riviera Maya luxury resort, explore the incredibly clear waters jumping waves on a wave runner, gliding back and forth on water skis, or through your mask while snorkeling. 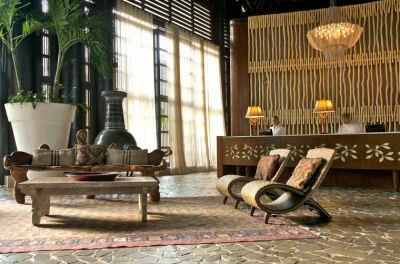 The Grand Mayan Riviera Maya luxury resort is a private escape into the world of the Mayans. History mixes with the modern to create a vacation that is truly unforgettable. At your Riviera Maya luxury resort, relax in a world-class spa, experience Riviera Maya's gourmet restaurants and fine dining on site, or watch the sunset from the beach with a refreshing tropical drink. If sultry nightlife intrigues you, head into nearby Cancun for a wide variety of bars and dance clubs. Here, paradise is yours. 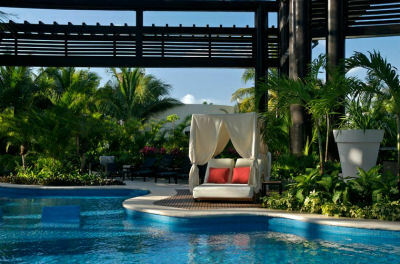 Happiness awaits at The Grand Mayan Riviera Maya luxury resort. The Grand Master Room is a 603 square foot room offering everything you need for a perfect vacation: king size bed, sleeper sofa, marble shower, whirlpool bath tub, double sink vanity, LCD television and balcony. Accommodates 2 adults and 2 children under 12. One-way transportation Airport to Hotel (contact concierge 72hrs before check-in), transportation throughout the Resort, local phone calls, basic Internet for 1 device, Gym Access, Press summary, a welcome drink and boarding passes/faxes printing.